The Leachco Snoogle Chic Total Body Pillow is one of the top 10 best pregnancy pillows you can order online today. It offers excellent comfort and relaxation for the pregnant mother. The discerning pregnant mother soon discovers that a single (conventional) pillow is not enough to fit all their needs. 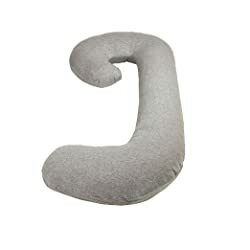 They need a pillow on the back to provide support, two for propping the head, another one to provide support and comfort for the tummy area, not to mention another one between the legs for temperature control. But managing all these pillows can be something of a nightmare instead of offering solutions that work. That is the dilemma the Snoogle Chic Total Body Pillow by Leachco solves and with quite some aplomb. The Leachco Snoogle Chic Total Body Pillow is designed following excellent research and design process, this is a body pillow in its own class. It fits around the natural contours of a pregnant mother when lying prone. It therefore allows the pregnant mother to sleep in her natural position without jeopardizing the health of the mother or that of the baby growing inside her. A pregnant woman’s body requires more than the ordinary amount of comfort, propping and support. The back requires sturdy support specially when lying on the side. It is also important to prop the neck and head with at least a couple of conventional pillows. Just as well, the pregnant woman needs something comfortable to prop up her tummy when lying on the side. There is also a need to have a pillow between the legs for temperature control. By following the innovative horseshoe shape, the Snoogle Chic offers all these functions in one tidy package. The Snoogle is designed to offer excellent comfort, whichever position you are relaxing in. The pillow is just as suitable if you are lying on your side as it is if you are on the back. It also offers excellent support while seated and can be adjusted to fit the requirements of both tall and short people. Leachco is a designer of high quality products for mother and baby. The Leachco Snoogle Chic Total Body Pillow just like the Snoozer Full Body Pillow before it, illustrate the high performance credentials the company has and which set its products apart from the rest of them in the industry. When you buy the Snoogle either for yourself or as a gift for a mother to be, you are bequeathing a gift that will keep on giving for years to come.